Before beginning the long journey by train back to North Korea - a trip that will give him an opportunity to meet face-to-face with senior Chinese officials, and possibly President Xi himself - Kim Jong Un met with Vietnamese officials on Friday as speculation mounted about what the collapse of the talks in Hanoi might mean, not only for the detente between the US and North Korea, but for the US's trade deal with Beijing. As analysts parse comments made by senior North Korean officials during a midnight press conference, many fear that Kim might restart his missile tests and revert to his belligerent anti-US rhetoric as the country's 25 million citizens are struggling through its worst economic recession in 20 years. According to Bloomberg, hardliners in his government believe a more warlike posture would improve Kim's negotiating position. But that doesn't necessarily mean a total collapse of the US-North Korea detente is inevitable. 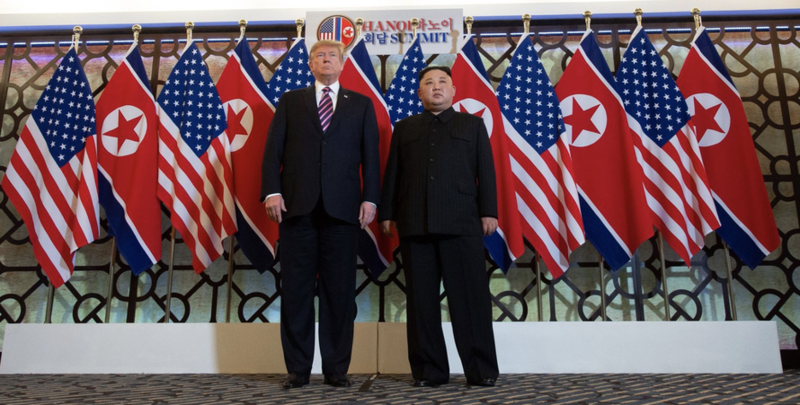 "Kim also invested a lot in the summit," said Shin Beomchul, director at the Seoul-based Asan Institute for Policy Studies’ Center for Security and Unification. "Kim’s domestic political risk is also high." Despite a North Korean vice premier's warning that Kim may have "lost the will" to continue negotiating, it's looking increasingly likely that Kim will keep talking, and possibly benefit from some additional help from Beijing. During a press conference on Friday, Chinese Foreign Ministry Spokesman Lu Kang said the UN should consider modifying the North Korean sanctions regime to allow the hermit kingdom some economic relief. United Nations Security Council should consider holding a debate to modify sanctions against country, Chinese Foreign Ministry spokesman Lu Kang says. Lu responds to question in Beijing briefing Friday about breakdown in nuclear talks between the U.S. and North Korea. President Trump said Thursday that the North had demanded the immediate lifting of all international sanctions - including the six rounds of UN sanctions administered since its 2016 nuclear test in exchange for closing its biggest nuclear facilities under the supervision of US monitors. Coverage of the summit by North Korean state media offered a decidedly positive view of the summit, glossing over the tensions between the two leaders and committed Kim to further negotiations. Still, if the North doesn't see some economic relief soon, worsening hardship could strengthen hardliners' demands for a return to a more confrontational approach with the US. Still, Kim faces his own time pressure to escape a U.S.-led campaign that helped push his already impoverished country into its deepest recession in two decades, according to the South Korean central bank. North Korean diplomats said talks broke down after the U.S. refused to support lifting sanctions imposed since 2016 in exchange for dismantling its aging Yongbyon nuclear complex. That demand appears to cover five rounds of United Nations Security Council measures approved since North Korea’s fifth nuclear bomb test in September 2016. Those penalties, which would require U.S. support to undo, include everything from restrictions on North Korea’s oil imports to a ban on its export of iron and coal. Still, China's "strategic decision" to improve its relationship with the North (not to mention the thaw between North and South Korea) suggest that Kim can do more by leveraging his international partnerships to secure more concessions from the US. And though President Trump was willing to walk away on Thursday, should ties between the US and the North completely unravel, he would be forced to walk back all of his glowing pronouncements about Kim, and his boasts about the warming relationship with North Korea being a singular geopolitical triumph.